Homeless advocate Charito Morales walks the Conrail track near Gurney St, Monday morning to provide assistance to those in need of social services after the city of Philadelphia and Conrail clear and clean the area used by homeless and those addicted to drugs. 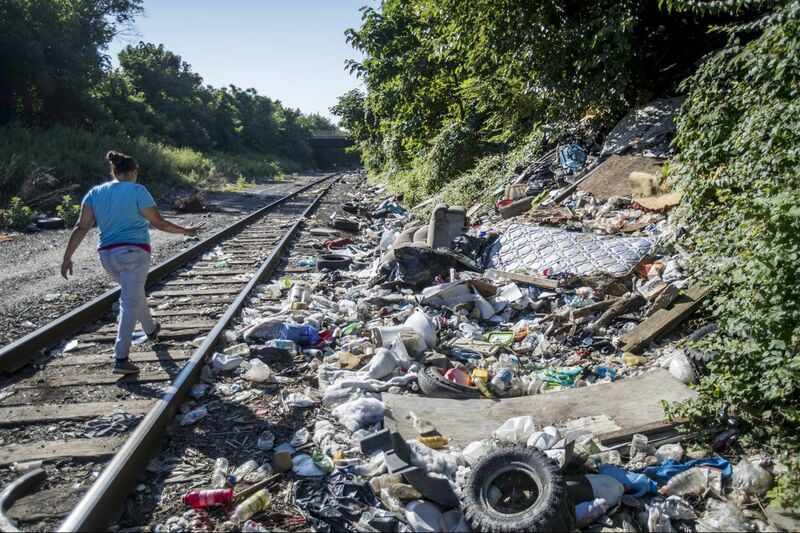 That’s what Councilwoman Maria Quiñones-Sánchez said Monday morning, hours after contractors began cleanup work along the Gurney Street railroad tracks in Kensington, which had become a trash-strewn camp for heroin users and a ghastly representation of the nation’s opioid crisis. Conrail, which owns the tracks, deployed construction equipment at 7:30 a.m. to commence clearing the grounds of what neighborhood residents call El Campamento. Much of the initial work seemed to take place on the periphery of the camp, with bulldozers flattening a “staging area” for construction vehicles to the east, and crews clearing overgrown shrubs and trees above the sunken tracks. Most of the camp’s inhabitants had already left — some into treatment, others to city-funded housing, and others likely searching for somewhere else to live. Still, small groups of people, often in pairs, could be seen Monday morning wandering through the steep embankments of the tracks, illustrating the challenges of completing the cleanup safely and ensuring its effects will last. Charito Morales (right) points out to Sam Tiru of the Public Health Management Corp. where a family was living under the A Street bridge until recently. The city and social service agencies set up outreach tents and trailers in the neighborhood to try to offer help to those struggling with addiction or homelessness. Officials said they were encouraged that 23 people had approached the new outreach sites Monday seeking treatment for addiction. On average, about 12 to 16 people per day in Kensington seek treatment, said Alicia Taylor, spokeswoman for the city’s office of Health and Human Services. New fencing already had been installed on seven bridges that cross the tracks, according to Managing Director Michael DiBerardinis. Another 1½ miles of 6-foot fencing will be installed by Conrail on the sides of the tracks as contractors continue their cleaning efforts, expected to be completed in about 30 days. “Today we are taking a big step in what will be a long journey,” DiBerardinis said. Officials from Conrail, the Mayor's Office, the Police Department, and elected officials including Quiñones-Sánchez and State Rep. Angel Cruz (D., Phila.) all spoke at a news conference in the middle of the newly established outreach hub at Second Street and Indiana Avenue. "Never have I seen such a coordinated effort to make things happen," said Quiñones-Sánchez. Some in the area worry, however, that once the cleanup is finished, overdose fatalities in the area actually could increase as users shoot up in abandoned houses with no one watching out for them. Jose Benitez, executive director of Prevention Point Philadelphia, the health-care provider and needle-exchange agency that has worked with the community for years, said last week that day visitors to the camps have been dispersing into the neighborhood, using drugs in vacant homes, parks, and anywhere they can find shade. Lauren Hitt, spokeswoman for Mayor Kenney, said that the city's outreach workers "are committed to going wherever the need is — including into abandoned houses." Inspector Ray Convery, a police commander who oversees the area including the tracks, also said that getting users above-ground would make it easier for officers to find users in need of help. The tracks had become so covered in trash and vegetation, he said, it had become difficult and dangerous for law enforcement to patrol and monitor the area. Monday was the contractual deadline to which Philadelphia and railway officials agreed last month to begin the process. Just 17 of last year's 907 fatal overdoses in the city occurred at the encampment, according to the Medical Examiner's Office, a statistic that placed Benitez among the worriers. Still, officials were resolute in saying that Monday marked the beginning of a new type of effort to comprehensively address the opioid crisis, even if it needed to be done one step at a time. "We are eliminating a situation that attracted drug users to the neighborhood from across the region and the Northeast part of this country," DiBerardinis said. "And we are attempting to create an environment where it will be easier for our resources to engage the folks who need it the most."